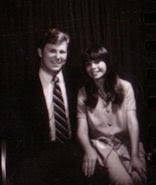 A very long time ago, well in people years--40+ years ago when Steve and I were dating. I told my boyfriend, Steve (my husband, now) that I couldn't smell skunk smell. That story started when I lied to my mother that I wanted to keep a spotted skunk that I caught in the backyard with a Have-A-Hart Trap. I could get it de-smelled by Dr. Nelson in Fillmore. She told me he wouldn't do it and I told her I didn't even smell it! It wouldn't bother me! She knew that wasn't true because our cat was burned by the smell of a skunk in her face and it was so bad she ended-up at the vet after a tomato juice bath. We all knew the bath probably "stung" more on her burns than the actual burn. yeah...the cat smelled--reeked. 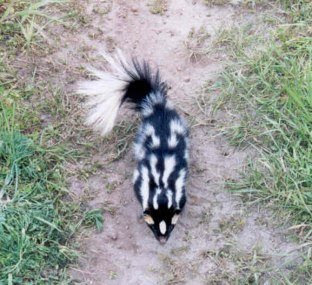 I caught the baby spotted skunk when I was about 10 1/2. My whole family was here including my O'Connor grandparents and my Uncle Frankie. It was Mother's Day May 8, 1960. I pretended right off... that I couldn't smell the baby skunk because I wanted it so bad. 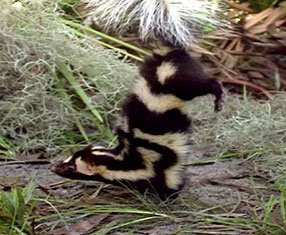 Even when it stood on its front hands (yeah, their feet look like baby hands) and the little baby skunk let out this terrible smell. The skunk family had been raiding our chicken coop, so when my dad woke-up and saw my catch he wanted to well.... it's too harsh to even think about, even with his "tender heart." So, because I loved it I let it go. I had watched the Disney movie called "Perry" with my heart-throb of my very young youth, Billy Mumy. Remember, "Lost In Space?" He was the character "Will" and he had this robot, called "Robot." Anyway, later he was my Movie Idol and I wanted a wild animal to raise, especially one that looked like a kitty. I told my future husband--I mean really early in our dating to just be silly. 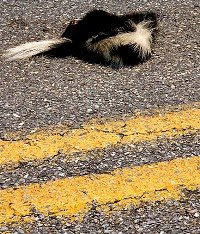 There was some skunk road-kill and Steve said, "Oh, no!" "Do you smell the skunk?" I explained this long drawn-out story about I had this inherited gene that doesn't smell skunk. I was just kidding and I was going to tell him, but I forgot and each time we encountered the smell he would look at me funny like, "I know she smells it!" I would ignore the smell and then conveniently forget again. I carried the joke with me for months. We got engaged and I kept doing it--it was so fun! And then getting married, I still forgot with all that involves getting really for the wedding. I meant to tell him the truth, really, it was just a joke! We moved after we were married and went up to San Jose. There's not a lot of skunks in that city, at least in 1971. I completely forgot about skunks, just focused on my real babies, as in new Tressa and Dustin. 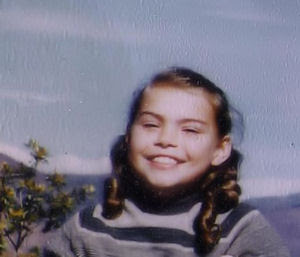 1973, Steve and I moved back home to a ranch in Santa Paula. Our home was in a farm house on the country and the west-side. The ranch was out in the middle of avocados, lemons, and orange orchards and critters all around. And.....one night....a skunk visited our house. Yes, he left his "calling-card" under our house. I said, "Oh my gosh, that's the most potent skunk I've ever smelled!" My husband, now of almost 5 years, was super confused!!! "You smell that?" "DUH!" and then I remembered....I forgot to tell him and I got caught. Honestly, now we smell skunk and he says, "Do you smell that?" I usually, meekly say...."wwwhaaatttt?" And that's the story of the skunk and I still want one! i had never heard that story. you are a silly one.